Life has been unbelievably busy. You can tell because I haven’t been blogging. And this probably wojn’t be a particularly long post, but since I’m here at Beer and Blog, I sort of feel obliged to blog, since I haven’t in the last couple of weeks. This week has been so long that last night, as I was trying to figure out what to say at the Into Judaism class I was teaching, I was tweeting random passages from the Bible. This week has been so long that I couldn’t keep track of the various meetings I was having or who was supposed to be in them. This week was so long that marathoners wouldn’t have run it. This week is so long that I can’t really come up with anything amusing to say on the subject. In any case, it has been a humbling week, as I’ve desperately tried to do more than I really could, and discovered I couldn’t do some of the things I expected to be able to do. 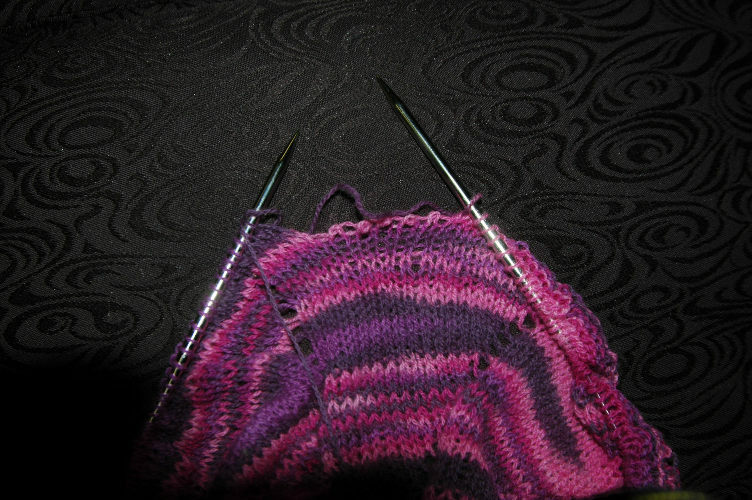 I got virtually no knitting done.I sat in more hours of meetings than I can count. I understood far less of what was said in those meeting than I should have. Nonetheless, the week has ended, and Shabbat has come. And everything else is just commentary. A day of rest, a day of restoration for the soul. A day before a new week begins. I don’t know what it is today, but everyone seems tired. Not just me and Eva (we’re used to that), but a lot of the people at CubeSpace. Not only that, but there are fewer people than usual at CubeSpace today, making me think that many people just didn’t have the energy to come in at all (it is possible that I’m projecting here). There is a profound lack of energy today. It’s quiet, as though making noise requires too much work. The phones are ringing less, suggesting that pushing the buttons might be excessive labor for the mood of the day. People are so tired that this is what I’m trying to pass for humor. It’s sort of a shame that there aren’t more people at CubeSpace today, because we are dying eggs and doing an Easter Egg hunt. I sort of have a feeling I may be spending a lot of time trying to find the eggs which we hid yesterday. OK, I just tried and failed to add some pictures of hidden easter eggs, but it completely failed. In fact, it crashed my computer. So we’re done with that now. I apologize for the lack of material in this post. In the meantime, be amused by the idea of the rabbi with a business filled with Easter Eggs which need finding. Yesterday did not go well. I was tired, out of sorts and had knitting problems. I’m working on my first pair of toe-up socks with a short-row heel (if you aren’t a knitter, don’t worry about the details–this is simply a slightly less common way to knit a sock, but one that is not any harder than the “normal” way). I’d finished the decreases and was beginning increasing the heel (1/2 way done with the tricky part for you non-knitters) when a needle slid…and about 8 stitches dropped…not the last 8 stitches, the 8 I was about to knit…(for you non-knitters, this is “not good”). I’ve picked up lots of dropped stitches before, and just kept on going. But these looked evil and difficult to pick up. Some of those stitches dropped back 2 or 3 rows pretty much immediately (moving from “not good” to “decidedly bad”). A better blogger than I would have snapped a photo of this to share with you all, but I just couldn’t face it. So you’ll have to take my word for it. It was ugly. So I did what all right-thinking knitters do when life gets tough: I reached for a different project. I pulled a lovely shawl I’m working on out of my bag. This is a circular shawl, which means the needles should form a complete circle around the outside…but somehow there seemed to be a larger gap between the needles than I was expecting. There it is. a whole bunch of dropped stitches. Neither of these are, in fact, big problems. They were just more than I could deal with yesterday. So I resolved to do no more knitting. When I returned to this this morning, I discovered it was not such an insurmountable problem. Rip back a few rows, pick up the stitches, all better. I haven’t tackled the shawl yet, but it should be just as simple (simpler, actually). Sometimes, you just need to let things sit for a day.